NEW! mini size tailored to fit small journals like the pocket sized moleskine! Having an idea and nothing to write with can be very frustrating and while pencil cases keep your pencils in one place they don't necessarily end up where you need them. The journal bandolier is my solution to this problem - you might find it useful too! 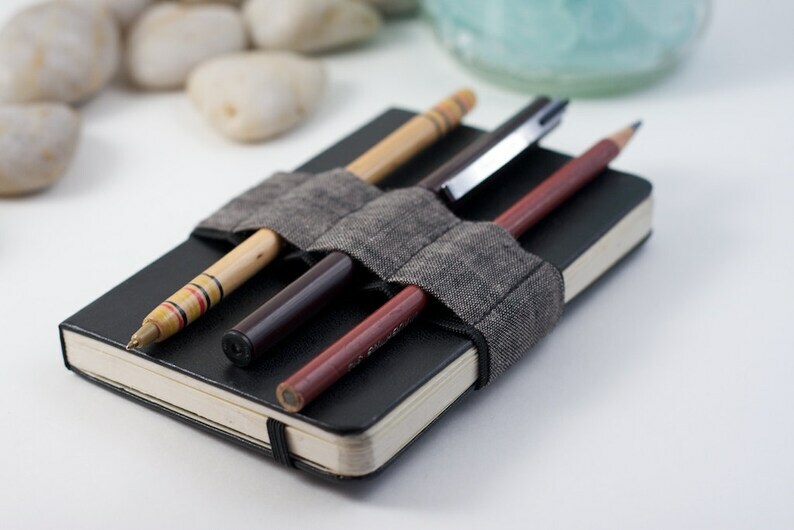 Your pens and pencils at your fingertips and with your journal. Travel light - draw often. This bandolier is made from elastic and dark grey linen fabric. - It will stretch to fit books with circumferences from 8" to 9"
Had it customized to fit my Sketch Wallet. This lady nailed it! Shipped on time and stretches to fit a slightly larger size than the moleskine described! It was a gift for my boyfriend for Christmas, and he enjoys being able to have microns with his journal, ready for use!